Justice Department asks Supreme Court to let travel ban take effect. 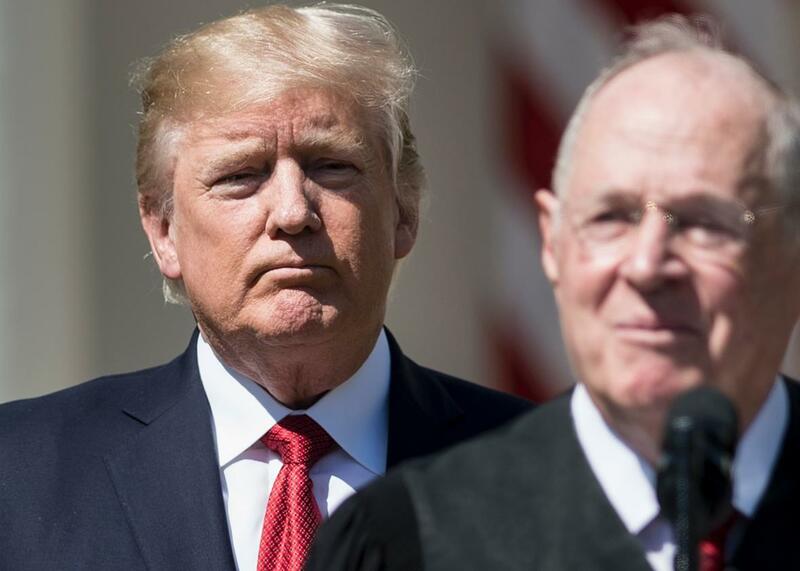 President Donald Trump and Justice Anthony Kennedy. On Thursday night, the Justice Department finally asked the Supreme Court to wade into the fight over President Donald Trump’s second travel ban. In a flurry of filings, government attorneys asked the court to review a recent ruling maintaining the block on the ban, arguing that the decision was deeply flawed. They also implored the justices to immediately lift injunctions placed on two central components of Trump’s executive order—one barring entry of individuals from six Muslim-majority countries, and another suspending the refugee program, then halving the number of refugees admitted to the U.S. The upshot here is that we will soon discover whether a majority of the Supreme Court agrees with the lower courts’ consensus that Trump’s order runs afoul of the First Amendment. Under the Supreme Court’s rules, four votes are required to hear a case, but five are required to stay a lower court’s injunction. If the court’s five conservatives believe the ban is constitutional, they can act quickly to let the order take full effect. If at least one conservative has concerns about the ban, the court can keep it on hold. This calculus, of course, presumes that all four liberal justices agree that the order is unlawful—a good bet, but no sure thing. As usual, the outcome appears to rest on Justice Anthony Kennedy’s shoulders, and it is impossible to say with certainty which way he’ll swing. Meanwhile, the 9th U.S. Circuit Court of Appeals has not yet decided whether the Hawaii judge’s order was proper. The Justice Department could have waited for the 9th Circuit’s decision to come down, then asked the court to review both the 9th and 4th circuits’ rulings together. But it seems Attorney General Jeff Sessions grew impatient with the 9th Circuit and chose a different strategy, entreating the Supreme Court to review the 4th Circuit’s decision—and, in the meantime, to lift both injunctions, allowing the full ban to take effect while the court considers its legality. So, what will the Supreme Court do? Or to put it another way, what are the factors that Kennedy will weigh in gauging the bans’ legality? On the one hand, the 4th Circuit’s decision rested on the conclusion that “there is simply too much evidence” of “religious animus” for the order “to survive any measure of constitutional review.” Kennedy has relied on the anti-animus principle to reach progressive results in other contexts, and it’s plausible that he might do so here. On the other hand, Kennedy has disavowed the legal framework, called the Lemon test, that guided each court’s Establishment Clause analysis. The Lemon test requires government action to have a secular purpose in the eyes of an “objective observer”; Kennedy views this standard as overly malleable and unduly stringent. Yet it lies at the heart of the challenge to the travel ban. The conservatives could also duck the Establishment Clause question altogether, finding that the plaintiffs don’t even have standing to challenge the ban, or holding that the president’s broad authority over national security prevents such a searching inquiry. Either way, the Supreme Court guessing game is nearly over. The justices now have an opportunity to show their cards, and their decision could soon revive a sweeping ban that many Americans likely assumed to be dead and buried.